King Tertius believed the number three was tied to his destiny. He was one of three brothers. He was the youngest, and by the laws of succession, he should not have become king. But his eldest brother sought a life of peace and meditation, and so forsook the throne. He joined a monastery and pledged to spend his life in service and contemplation. His second eldest brother sought to explore, to be a knight always, seeking adventure, and conquering wickedness. He wandered one day into the land of the fairies and was lost for many years. In the third day of the third month of the third year after he was lost, the kingdom received word that he had settled in the land of the fairies and become a king among them. He could not be a king of two lands, and he knew he had one brother left, so he entreated his brother Tertius to inherit the kingdom that was now his to rule. So, the third and youngest prince became king. And it was well, for Tertius loved his kingdom, and he ruled well, consulting his counsel of three, but ruling according to his will and his people’s will. When he married, he chose the third noble lady he met, not only because she was the third, but because in truth, she was the one who best engaged his interest and charmed his heart. Once, the royal treasury was robbed by daring thieves. One of the three silver crowns that had been worn by the king and his brothers when they were princes was stolen. It was recovered by the third knight that the king sent after it. And when the thieves were presented before the king, he told them why they had failed to keep hold of the crown. For he had learned that three came into the castle to steal the crown, but once it was in their possession, there were five who sought to profit from it. So when the king and queen began to have children, the king desired to have three. And the queen laughingly agreed, for she knew her king would want three heirs before she ever wed him. While the previous king and queen had three sons, Tertius and his queen had three daughters. The first was Prima, the second was Proxima, and the third was Tria. They wore the silver crowns that their father and uncles wore before them. And all was well, for the princesses were dear to their father. They were dear to all, for the princesses, while spoiled and proud, were also good-natured and loving. When the people teasingly called them Princess Number One, Princess Number Two, and Princess Number Three, they did not object or balk. In fact, they rather relished their pet names, for it was in honor of the king, who adored numbers. The girls were different, but in one way they were the same. For they excelled in all things at which they endeavored. So the people devised rhymes to accompany their pet names for the princesses. Princess Number One could never be outdone. Princess Number Two was always tried and true. Princess Number Three mastered all that she could see. And the princesses adored each other, but were fierce rivals in all they learned and did. Princess Number One, being eldest, spoke much and well. She was elegant and charming. Princess Number Two was rambunctious, much as her adventurous uncle had been. Princess Number Three was quiet and pensive. The king doted on all, but to many it seemed he favored Princess Number Three. She was the third child, as he had been. And she bore the number in which he placed such faith. When it was discovered that the queen was with child again, the king was surprised and he was irked. After their third child had been born, both the king and queen had taken measures to assure they would have no more children. The queen was troubled, for she loved and trusted her king, but his faith in threes was so strong that she began to worry what might become of her fourth child. Before anyone else learned about the child, the queen spoke with the king. Though she would not give up the child to another, she begged the king to let the child be adopted by her sister, who was one of the queen’s attendants. That way, she could still dote on the child, still see the child, and still give the child a comfortable life. But when the king saw how pained his queen was, though she hid it well behind a mask of calm and courage, he realized what a dark and wicked thing it would be to surrender his child for his belief. But he was conflicted, for his faith in threes was strong. Then a notion struck him. “Perhaps it will be a son,” he said to his queen. “Perhaps we were meant to have three of each.” And with that thought, his heart grew light, and his hope was rekindled, for he believed it must be so. And the queen was relieved. For she did not wish to give up the child that was still growing within her. Then the child was born. And the child was a girl. And Princess Number Four was presented to the world. The king began to fear, for his faith in threes was so great, that he thought he was fated to lose one of his children so that in the end there would be only three. Though he loved them all, he could not help but to feel distant from the fourth child, whose coming into the world had twisted all his joy into sorrow. He kept his distance too, in those first few weeks after she was born. But whenever he heard the baby’s cries in the night, whenever he saw the gleam of curiosity in his other children’s eyes as they gawked at their newborn sister, whenever he saw the glowing smile upon his queen’s face when she gazed down at her youngest child, the king set aside his faith in threes. He became as mesmerized and enchanted with his fourth child as he had been with his first three. Though the king loved all his daughters, it seemed to him that his and his kingdom’s fortunes were turning with the arrival of the fourth daughter. Harvests were thinner. Winters were harsher. Prosperity faded and made way for scarcity. Darker days than days of poor harvests were to come. For the queen grew ill while the fourth princess was still crawling. The royal healers could do nothing but to remain by the queen’s bedside as she fell into a long stupor. The people, knowing well their king’s faith in threes, some even believing in it, wondered if Princess Tessera was the cause. Princess Number Four walked in the shadow of her elder three sisters. She was good at all the things she was made to learn, but in any given way, one of her sisters always surpassed her. The people added a line of verse to their rhymes about the princesses, a line that reflected their doubts and worries. And Princess Number Four, why she could do no more. For she could do no more than her sisters did before. Princess Tessera learned to be humble and hidden. She became the peacemaker among the sisters. Whenever the others bickered about who was better at something, the fourth sister always laughed and said that at least they could all agree that she wasn’t the best at the thing. But by such humility, she taught her sisters too to be more humble than they otherwise would have been. It was her sisters who presented Princess Tessera with her own crown, forged of copper, according to an old custom from their mother’s native land. Copper guarded the wearer from malice and harm. There was one way in which Princess Number Four was not humble, at least when she was alone with any one of her sisters. “The rest may be best at all else, but I’m your favorite sister,” Princess Tessera would say, sometimes with a smirk of a smile, and sometimes with a quirk of her brow. The kingdom struggled, but abided. The princesses grew older, even as they waited and hoped for their sick and slumbering mother to wake. Then one day, a grave and dastardly deed was uncovered by the royal investigators. People all over the kingdom’s capital had begun reporting that their children were acting strangely. The royal investigators discovered that changelings were being left in exchange for a family’s true children. It was the work of the fairies. But the fairy realm was far away and they had never before troubled Tertius’s kingdom. Before he could even begin to devise a plan, the king was visited by the parents of the missing children, in whose homes a soulless changeling had been placed. They asked him, begged him, to speak with his brother, the second eldest brother, who had never returned because he had wandered into the land of the fairies and become their king. King Tertius did not know how to reach his brother. He did not want to believe that his brother and the fairies were responsible for stealing the children. But the royal investigators captured a fairy whom they found wandering in the woods. The fairy admitted that he had been dispatched by his king to seek and bring back a special child. Though the fairy king had once been a man, he had exchanged his mortal form for fairy powers. He could not have children of his own. But he longed for an heir. The king sent a message to his brother through the fairy. And he received a message back in kind. It seemed, the king’s brother had been living with the fairies for too long, for his heart was now full of mischief. He told King Tertius that he would cease searching among his subjects if the king were to send one of his own daughters into the fairy realm, so that the fairy king might adopt her. He even allowed that he would only take a willing child. But if none of the princesses was willing, then the fairy king would continue seeking from among the kingdom’s subjects, until he found the child supreme. King Tertius sent an envoy of ambassadors to entreat his brother, but the envoy failed. Then King Tertius gathered the best thieves in the kingdom, promising to pardon all their crimes if they would steal back the children. But the thieves too failed, for they could not find the entrance to the fairy realm. Then the king decided he had had enough. He began to gather three-hundred and thirty-three of the kingdom’s best knights to march upon the fairy kingdom and demand a return of their children. The king had tried to hide the particulars of the kingdom’s crisis from his daughters. Though they did not rule, the princesses felt some of the burden their father carried, for he was dear to them, and they wished to ease his worries. The princesses learned of the bargain that the fairy king, their own uncle, had proposed. If one of them, of her own will, were to become his child, then he would stop his fairies from stealing any more children. For they would have a princess of their own. The princesses four approached their father as he prepared to lead the small army of knights against his own brother, the fairy king. The princesses had agreed amongst themselves to offer their aid as one, for they would need all the skills they possessed to find and face the fairies. But as soon as they had audience with their father, Princess Tessera spoke first. The king’s heart leapt with pride and strained with pain. For when he looked up the dear face of his fourth daughter, his faith in threes collapsed. But before he could speak, another daughter spoke. In answer, Princess Number Four simply reminded all that she was never meant to be. She had disrupted the rule of threes, and perhaps it was for this very reason, that one day, she would be needed to set things right. But the princesses four could not be ignored. Their father held prisoner a fairy messenger who had come to deliver the last message from their uncle. King Tertius meant to send the messenger back and have him followed. The princesses found the messenger and told him to deliver their message of agreement with the fairy king’s bargain. This the fairy messenger did. Though the princess’s had given no warning about the spies who would follow the fairy, the fairy evaded the king’s spies. In a few days’ time, the fairy returned, flying straight to the princesses to deliver their uncle’s reply. He appointed a time and place for them to meet. The princesses gathered in the woods surrounding the castle and the capital at the appointed time. They waited for a few hours past the appointed time. When day became dusk, the princesses wondered if they should return to the castle. But then, from the shimmering of dust within the last rays of daylight, they spotted a retinue of fairies approaching, led by none other than the uncle that the princesses had never known. Nevertheless, they recognized him, for he looked much like their father. The princesses had hoped to entreat their uncle, to try and influence him as ambassadors and thieves and knights could not. They hoped that he would feel some love for them and take mercy. He smiled fondly at them while they spoke their sweet entreaties, but the the only bargain he would accept was the one he first proposed. So at last, they were come to an impasse. And once more, spoke Princess Number Four. “Ah, I see. Unwanted. Unneeded,” the fairy king said. “She is very much wanted,” said Princess Number One. “And very much needed,” said Princess Number Two. “And very much protected,” said quiet Princess Number Three, as she lifted her bow. The princesses three formed a flank around their young sister. Princess Tessera’s heart filled with courage then, courage born from the unwavering love her sisters had given her all her life. And courage born of the certainty that she was meant to be after all, even if her people would never know that she could do more. A tense silence followed as no one present moved. “She is right,” a quiet voice said. It was Princess Number Three. The fairy king allowed the princesses a long and tearful farewell. Then he and his fairies watched as Princesses Prima, Proxima, and Tria left the clearing and returned to the castle. “How could you let her go! How could you not protect her!” the king cried as three of his daughters stood before him, having delivered the news concerning his fourth. But then he gathered his three daughters in an embrace and told them not to worry, for he understood what they had tried to do, and he would recover their sister for them. The three princesses asked the king to honor their sister by gathering more knights, until they numbered four hundred and forty-four. They begged their father to wait until then before he marched, for he did not even know as yet, where the entrance to the fairy kingdom was. Thus did they hope to give their sister enough time to find that entrance and send word to them of how they might defeat their uncle without bloodshed or war. The princesses three missed their young sister, and feared for her. They comforted each other as best they could with remembrances of her. “I might have been jealous of you, Sister Number One, if not for Tessera, who reminded me of the many ways in which I was superior to you,” said Princess Number Two. “Our father once believed he was meant to have three, but Princess Number Four was always meant to be,” Princess Number Two said. And her sisters nodded and smiled resolute smiles. The princesses had discussed all manner of ways they might trick or compel their uncle into revealing how and where the fairies were entering their kingdom to steal its children. In the end, Princess Number Four suggested that she just ask the fairy king. If she were to be a fairy princess and his daughter, then he must tell her about her kingdom. Perhaps her uncle was even tired of mischief and trickery, and would welcome her honest questions and give her honest answers. She asked, but to no avail. The fairy king tried to distract her with games and gifts and a parade of pretty fairy servants. He presented her with enchanted foods in bright and beautiful colors. When she spoke of how her father would let her wear his crown and help him to don his royal robes, the fairy king sought to impress her by letting her wear his own crown, and showing her wonders like his quiver of arrows made of light and his cabinet of enchanting potions and powders. The fairy king said that he would, but that he must release the stolen children one at a time, and that they must be asleep, so they would not remember the way back and could not tell King Tertius. Princess Number Four had spent many a year learning and practicing how to remain unseen, no matter if she were in a ballroom or a wood, so that she would not ruin her father’s rule of threes. It was a particular talent that her sisters did not have, for they spent their lives being seen and praised. She was so skilled at being unnoticed that she managed to escape the attention of her fairy attendants without alarming them to her absence. For she used their own tricks against them. She molded a changeling child in her image, and left it in her place while she wandered the fairy castle and its grounds, learning all that she could. Time moved strangely in the fairy kingdom. But Princess Tessera reckoned that she had spent almost a month in the place. In that time, she learned that her uncle was trying to amass an army of his own, a difficult task, for the fairies were disordered and mischievous. Their obedience relied upon their whims and fancies. And she learned how the fairies were stealing her kingdom’s children. The fairy king fed his finest singers a potion that made their voices entrancing to any who could hear them. The fairies would then sing songs in tones that only children could hear. Their songs cast the children into a dream-like daze, and summoned them to the woods surrounding the kingdom’s capital. The children would step into a clearing where the fairies had spent many years building a doorway between the capital and their own realm. They would bring forth a changeling, mold it in the shape of the particular child who arrived, and send that changeling back along the path taken by the child. It was dangerous for the fairies to have a doorway into their realm, for while the fairies possessed swords and arrows, they did not favor wielding such weapons, and even when they did, they were careless and reckless. As it was so, the fairy king had ordered protections. The door could only be opened by four keys, one for each cardinal direction. The keys could open the door from either side of the doorway. But all four keys had to be turned at the same time. If Princess Tessera could steal the keys, she could escape, and she could prevent the fairies from returning to her kingdom for a long, long while. But she could not manage alone. She needed her sisters’ help. So she sent them a message and a gift. The children who were sent back to the kingdom were given a draught to drink that made them forget their time in the fairy realm. But Princess Tessera found one whom she thought was strong enough and brave enough to carry a message to her sisters. She asked her uncle if she could administer the draught, and he indulged his new daughter. She hid the draught in her pocket and gave the boy some juice instead. She explained to him who she was and what he must do in service of his kingdom. The boy understood. While the fairies carried him out of the wood, believing he was asleep, he opened his eyes and remembered the path he traveled as best he could. He found the princesses and delivered to them Princess Tessera’s plan, written on a parchment wrapped around a vial of potion. Then it was up to the princesses three. Princess Number Two followed the boy’s instructions, and through much stumbling and trial, she led her sisters to the right clearing, where they waited and watched. In time, they spotted four fairies appear as if out of nowhere. The four fairies were facing the cardinal directions, and between them stood another fairy, holding a sleeping child in her arms. The fairy holding the child moved away from the clearing and toward the capital. The other four remained in the clearing. Once again, the sisters used the fairies’ own tricks against them. For Princess Prima was a master of poetry and song. She drank the potion that her sister had sent her, the same potion that the fairies used to entrance children. Her sisters stuffed their ears with wax while she sang so enchantingly that she entranced the fairies who stood in the clearing. While they stood in a dream-like daze, the three sisters dared to enter the clearing. Princess Number One kept singing as Princess Number Three passed through the open doorway. She vanished as she stepped between the four fairies. When again she reappeared, she had her youngest sister with her. Princess Number Four had been waiting on the other side of the doorway for her sisters to come through. Then, all four sisters took the keys from the four enchanted fairies. Princess Tessera fed to the fairies that same sleeping draught that she was meant to give to the boy. The princesses bound the fairies and hid them in the wood. The sleeping draught and the singing potion were not all that Princess Number Four had stolen. She had taken an arrow from the quiver of the fairy king. The arrow was made from light itself and was therefore quicker than any other arrow. She gave it to her sister Princess Tria. The four princesses now stepped into the fairy kingdom together through the open doorway, each wielding one of the cardinal keys. Princess Tessera showed her sisters where the children of their kingdom were being kept. So enchanted were the children that many did not want to leave the fairy kingdom to return to their homes. The princesses had to convince them. They soon managed, and the children followed their princesses back to the doorway. Princess Tessera led the way, for even though her sister Princess Proxima had the best sense of bearing, that sense was muddled in the twisted and befuddling realm of the fairy. There were dozens of children, and it took a long while for the princesses to lead them all back to the doorway without being seen. A few times they were seen, and Princess Tria fired her arrows at the fairies, aiming so that the arrows merely grazed and scratched the fairies. She had dipped each arrow in the fairies’ own sleeping draught. So each fairy who was struck fell into a stupor. All the children of the kingdom hurried along, led by their princesses four. When they reached the doorway, the princesses stood in each cardinal direction. They produced their keys, and they wielded them as they had seen the fairies do. As the holders of the keys, they could see each lock of the doorway. All together, they placed the keys in the locks and turned. A subtle shimmer of dust and pollen disturbed the air in the clearing. They saw no door. The locks and the keys hovered in the air. So they could not tell at first whether they had indeed succeeded. But Princess Proxima had marked well their way. Even if she could not see the ribbons she had tied upon the tree branches, she recognized the trees of the wood in her native land. The princesses began to shepherd the children through the doorway, instructing them to follow the path marked with ribbons by Princess Number Two. They were to hold each other’s hand as they walked so that none would lose his or her way. Just as the last few children stepped through the doorway, the princesses heard a great trumpeting and before they knew it, a host of fairies was flying toward them, led by their uncle, the fairy king. Princess Tria fired arrow after arrow, grazing the skin of several fairies, but there were too many for her to stop them all. Princess Prima tried to sing and enchant the fairies as she had done before, but her song had no effect. For the fairies had stuffed their ears, just as her sisters had. None would be enchanted by song. The sisters waited until the last of the other children passed through the doorway, and by then, they were surrounded by fairies. Princess Tessera nudged her third sister, and nodded to the one arrow she had left. It was the arrow made of light that Princess Number Four had stolen from her uncle. Princess Tria nocked the arrow. Many fairy archers nocked their own, fearing that the princess would aim for their king. The fairy king cried out to his fairies to hold, for he believed he had his nieces trapped and was eager to keep all four. Princess Number Three raised her bow and turned the arrow to the sky. She fired and the arrow moved too fast for the gathered fairies to do aught but gaze at it. The princesses four covered their eyes as the blinding light of the arrow flashed across the sky. While the fairies were blinded by the light, the princesses jumped through the open doorway. On the other side of the doorway, the princesses pulled the keys from the locks, and with a shimmer of dust and pollen, the doorway to the fairy realm vanished. The princesses four dashed away to hide in the surrounding bushes. They picked up rocks, and wielded daggers and darts, ready to fall upon the fairies if they should begin to emerge. But no fairy appeared. The doorway was truly closed. Everywhere in the capital—indeed in all the kingdom—the news spread quickly of the returned children, and of the manner of their return. The king was distraught at the danger the princesses had placed themselves in while he was busy amassing an army that never marched. But he could not deny that his daughters had achieved a valiant deed. In a few days’ time, while the capital prepared for celebration, a great commotion was heard in the castle. A great and happy commotion. For the queen was awake. After the princesses returned, one of the queen’s attendants had fled, for that one had been a fairy, who had been feeding the queen a sleeping draught ever since the fourth princess was born. As the royal family gathered at the queen’s bedside, the queen had a bittersweet reunion with her children, whom she did not know, because she had slept for so long. The kingdom had many a grudge against the fairy king. But they had much to celebrate in regaining the queen and all their lost children. “The ways into and out of the fairy realm are winding,” Princess Tessera said, no longer afraid to draw attention upon herself. No longer afraid to be seen. “Without the doorway, it will be a long time before we see the fairies again, though we must remain vigilant lest our greatest treasures are taken from us again.” Here she settled a fond gaze upon her mother. The king swept his gaze over the princesses. “There are four whom I trust to be the keepers of those keys,” he said. The king smiled at the queen, who marveled at them all. And it was so. The kingdom celebrated the return of the lost children and the waking of their long-lost queen. They honored the princesses four. 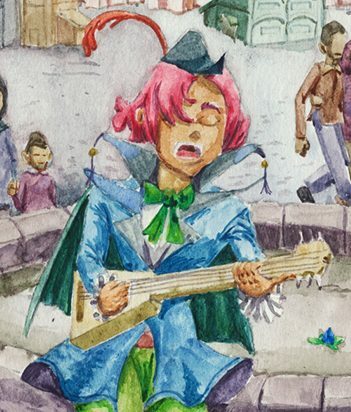 At the grand celebration in the capital square, several bards climbed upon a stage and chanted the peoples’ rhymes for the princesses, adding a verse for the princess to whom they owed more than they could repay. Princess Number Two is always tried and true. Princess Number Three masters all that she could see. Princess Number Four, why she could do no more. For she has saved our children, the wealthy and the poor. And she has solved the mystery of the secret fairy door. And she has stopped the march of a dark uncertain war. And so, of this one thing, her people can be sure. Our princess has done all for us. And she need do no more. The king laughed. The queen beamed. The gathered crowd erupted into cries and hollers of merriment. Princesses Prima, Proxima, and Tria stood behind their startled young sister, hooting and praising with their people. For Princess Number Four, had earned it all, and more. A truly beautiful story! I loved it. Thank you again, for reading and for all your supportive comments! Lovely story. Fairy tale style. Thank you! I haven’t done a story in the fairy tale genre for a while. I’m glad you enjoyed it.